More than 120 Elk were found dead 20 miles north of Las Vegas In New Mexico that were found on August 26 2013. 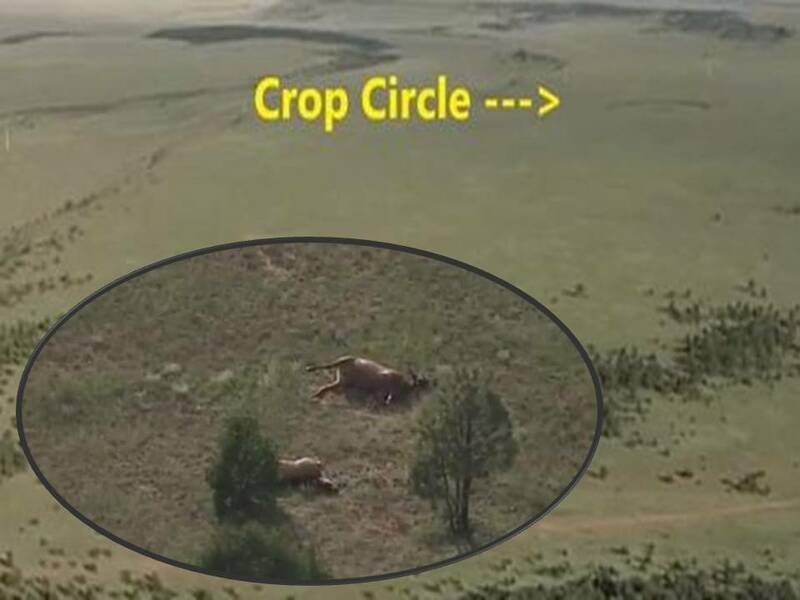 Within a few hundred feet there was a crop circle that was visible from KRQE's News Helicopter. The Elk were found in close proximity to each other suggesting they were not killed by a virus. Cokehead elk thats what they get for not paying the cartels. Los vegas is in southern Nevada. 20 miles North of loss vegas is still nevada. 90 miles north of loss vegas is still bevada. New mexico is right of nevada some two states away. Some one needs to look at a map before reporting. Next. I see a circle in a field, but a Very simple one. And not particularly large. 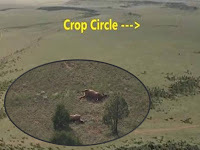 It could be cause by a great many things, it does Not mean it is a crop circle in the mysterious sense. Lastly, No Way is that caused by disease. That looks like they were gassed. Close proximity to one another, dropping in unison? Inhaled toxin is one of the few things which works that fast. Could be a test area near by, or geo thermal gass emission from deep volcanic activity. I wonder if volcanic or seismic disturbances have been recorded near bye. Or, if there is a military base near. Las Vegas is ALSO in San MIguel County, New Mexico. My grandfather was born there.Also, it's spelled "Las Vegas" for both locations. You're welcome. You know what else is 'nearby'? Dulce D.U.M.B.! not if it is 20 miles north of Vegas. lol. Hey, VARAKIENEN, there is such a place as LAS VEGAS, NEW MEXICO. Pull your head out for a few minutes and look at a map of the entire country. It may shock you to discover that there is more than one city/town named LAS VEGAS. BTW, Miami is about 50 miles north of Las Vegas. If you go about 70 miles NE from Miami, you'll be in Des Moines. Thanks for making everyone aware the depth of your ignorance. Hey, a Nice polite way of helping me become aware of a detail I may have previously been Unawares of. For that part I will thank you IF it pans out to be true. Now, for having made you feel so bad that you needed to try to jump on this in a desperate attempt to turn some table, I apologize for any "Past" transgretion. Being wise enough to see this silliness for what it IS? My name is BEN. I wrote the post enlightening you to other towns of the same name. Psychology 000 tells me that you are a narcissist and entering into any kind of debate with you would be pointless as you don't have the necessary intelligence. And, yes, I do have extreme contempt for you; as I would any evil person. You are a very disturbing creature. There is a very dark side to you, VARAKIENEN. Know that nothing you do is secret. And I have turned the table on you. I've exposed you for the TRUE EVIL that you are. You lose....in fact, you lost a long time ago, you're just too stupid to realize it. You post from a place of hatred and see the world as you want it, a reflection of your own negativity. I do not feel contempt for you. You you you you you you you you you you you - that's all I can see in your short post. It's also very telling that YOU didn't have much to say. Empty mind syndrome, perhaps? Perhaps its time to stop with the pointless attempts at attack, and return to the subject matter at hand? As yet, I have not seen you contribute to the actual subject in a constructive manor. Now, I know that many of the things I have to say are both informative, revealing, and all to often that which certain parties do not wish known. Such parties invest payment in trolls. Their purpose will be to distract, muddy the info, mislead, and if there is a strong voice present, to attempt to character attack or debate that voice to lead off topic, to leave a bad taste in the mouths of readers, and so on. IF, for some reason you wish to continue your antics,... IF you cannot return to the subject in an open minded and constructive manor,... You will have Identified your true nature. BTW, Does any one propose any notions as to what the circle might be? How many times you got to be owned before you get it. It is often best to opt out when one has neither education, sufficient research, nor leg to stand on. I think Mark Twain said it best, and I will repeat it for you here dear. "It is better to remain silent and be presumed a fool, than to open your mouth, and remove all doubt."